Until now, the biggest name in reverb came attached only to rackmount hardware. Finally, however, Lexicon have made their celebrated rooms, halls and plates available in plug‑in format. Lexicon's high‑end reverb hardware has been a mainstay of record production for more than a generation, and until now there hasn't been a direct software equivalent. DAW users have access to some excellent convolution reverbs, but so‑called synthetic reverb such as that created by Lexicon's algorithms offers a quite different character that's well suited to contemporary music production and that can be edited to a far greater extent. Convolution reverbs can capture the sound of some hardware reverb presets, but they can't translate the time‑dependent Spin and Wander modulation parameters that make up an essential part of the Lexicon sound, so though you may find web sites offering impulse responses taken from such machines, they'll never sound like the real thing. In response to the 'everything in the box' direction being taken by many recording engineers, Lexicon have finally produced a software reverb based on their high‑end algorithms, including some taken from their acclaimed PCM range. PCM Native Reverb is presented as a suite of seven plug‑ins, each offering a specific 'space' algorithm. The plug‑ins can be used cross‑platform (Windows XP, Vista and 7 are supported, along with Mac OS 10.4, 10.5 and 10.6 on Power PC and Intel machines) in VST, Audio Units and RTAS formats, with parameter automation supported as long as the host DAW permits it. Copy protection is via iLok. At $1500 for the bundle, the PCM Native Reverb is clearly aimed at the more serious user, including music professionals and post‑production, though it should also appeal to the project studio owner who might previously have considered Lexicon hardware. The seven algorithm types share a common user interface styled after that of the software editor for Lexicon's PCM92 hardware reverb. Opening the plug‑in window reveals the so‑called 'Soft Row' of nine key edit sliders. These are assigned to the most logical parameters for the current algorithm type, but as with Lexicon's high‑end hardware, you can go in deeper if you want to edit in more detail. However, you don't get the same bewildering matrix of minutiae that you did with, for example, the PCM91. Deeper editing is accessed through modifier buttons that appear above the faders. The number and function of these buttons depends on the algorithm. Input and output level meters provide visual feedback, while an EQ section allows separate adjustment of both the early and late reflections; as ever, Lexicon's approach is to synthesize these elements independently of each other. The available EQ types are single-pole low‑pass or high‑pass, double‑pole low‑pass or high‑pass, band‑pass or notch. Preset categories and names are also displayed, with presets stored in a format that allows them to be used within different DAWs. A further feature that you don't get with a hardware box is a real‑time display of the reverb tail shape and frequency content, with a number of alternative display views. These are quite informative, but are not necessary for the operation of the plug‑in. The Soft Row controls vary depending on which algorithm is running but typically allow control over the timbre, pre‑delay, room size and decay time of the reverb, along with any pertinent modulation, diffusion and delay feedback settings. You can see what parameter is assigned to a slider via the label above it, and if you click on the name, a list of all available parameters for that algorithm lets you select an alternative. All the parameters are available via the Edit pages whether they appear in the Soft Row or not. Pressing the Edit button in the plug‑in window gets you into parameter navigation mode, where four buttons at the bottom of the window then take you to 'fader pages' relating to Soft Row, Input and Mix, Reverb and Reflections. A Compare button lets you compare your edits with the unedited preset while Store lets you store your own settings. The PCM Native Reverb plug‑ins ship with comprehensive preset libraries, each preset usually having its own short list of variations. The Chamber algorithm is designed to emulate the rather small, reflective rooms used as echo chambers in early studios, providing a rapid build‑up of reverb density with randomised decay tails. It can emulate small or large chambers, with a useful degree of control over character, and works well on many musical styles. Hall is the most natural‑sounding concert hall setting. Here, the initial reflection density is low, due to the longer distances involved, with little energy coming back in the first 50 to 100 milliseconds. The reverb density build‑up is more gradual than for smaller spaces, and the reverb time tends to be fairly long, with low frequencies hanging on longer than high frequencies. This is one of the newer Lexicon algorithms and shares some of its characteristics with the Random Hall and Concert Hall algorithms, the main difference being its smoother, less synthetic sound. Random Hall is a Lexicon classic with a somewhat irregular decay shape, well suited to orchestral music, but also flexible enough to be used in more contemporary productions. Some modulation is built into the algorithm, which may show up on things like piano if wound up to excess, but otherwise it works extremely well. Concert Hall is, again, an updated algorithm with a lush, less dense sound that doesn't muddy the original source and adds a lively, spacious character. Again, there's modulation that may not suit tightly pitched instruments such as piano at higher settings, and its overall 'larger than life' flavour may suit contemporary music better than classical music. Plate is fashioned after the traditional studio plate, exhibiting rapid diffusion and a bright, slightly metallic quality. Plates are still the go‑to reverb for many drum and percussion treatments, and this one integrates beautifully with the original sound. Plates are also popular for use on vocals, as they add the necessary sense of space but without actually suggesting a particular type of space. The newer Vintage Plate algorithm offers an alternative take on the plate sound. based on Lexicon's updated PCM96 algorithm, and is, again, well suited to percussion and vocals. Left and right delays are also built in, so you can create echo effects or echo‑plus‑plate effects, with the option to sync delay time to tempo. The only other plate reverb plug‑in I've heard that is in the same league is the excellent Plate 140 for the UAD platform, but that is DSP‑powered. Finally, the Room algorithm is very versatile, coming with its own library of room‑type early-reflection patterns. As with the other algorithm presets, these are divided into Small, Medium and Large categories, and in this case there are five room types in each section, all scaleable in size and with the option to create reverse reverb effects. The range covers 15 simulated spaces, from small closets and domestic rooms to quite large spaces, in regular and irregular shapes, making it suitable for film post‑production as well as music and special effects. A Tap Slope parameter adds even more scope, by changing the level envelope of the early reflections portion of the reverb. At extreme settings this can hint at a gated or reverse effect, and is good for adding texture. The Room algorithm is where to start when you want to create an ambience‑type effect, where the reflections suggest a room character and add a sense of space but little or no obvious reverb tail. As you'd expect, the larger rooms do have obvious tails but the smaller spaces simply conjure up the mental image of a location without screaming 'Reverb!'. While competing plug‑ins use closely‑spaced discrete delays to simulate the early reflections of an ambient space, Lexicon's approach is more subtle, with little sense of discrete echoes, producing a much more natural sound. In real life, early reflections tend to be heavily diffused by the environment before they reach the listener, and that's exactly what's recreated here. Despite the flexibility of the Room plug‑in in this respect, though, I was surprised that there is no dedicated Ambience algorithm. The Soft Row controls vary depending on algorithm, but typically allow control over the timbre, pre‑delay, room size and decay time of the reverb, plus any pertinent modulation, diffusion and delay feedback parameters. You can see what parameter is assigned to a slider via the label above it, and if you click on the name a list of available parameters for that algorithm appears, so you can select an alternative. Pressing the Edit button gets you into parameter navigation mode, where four buttons at the bottom of the window enable you to flip between 'fader pages'. Again, these vary depending on which algorithm is chosen: in the case of the Plate algorithm, for example, they are Soft Row, Input and Mix, Reverb, Reflections and Echo. A Compare button lets you compare edits with the unedited preset, while Store lets you store your own settings. 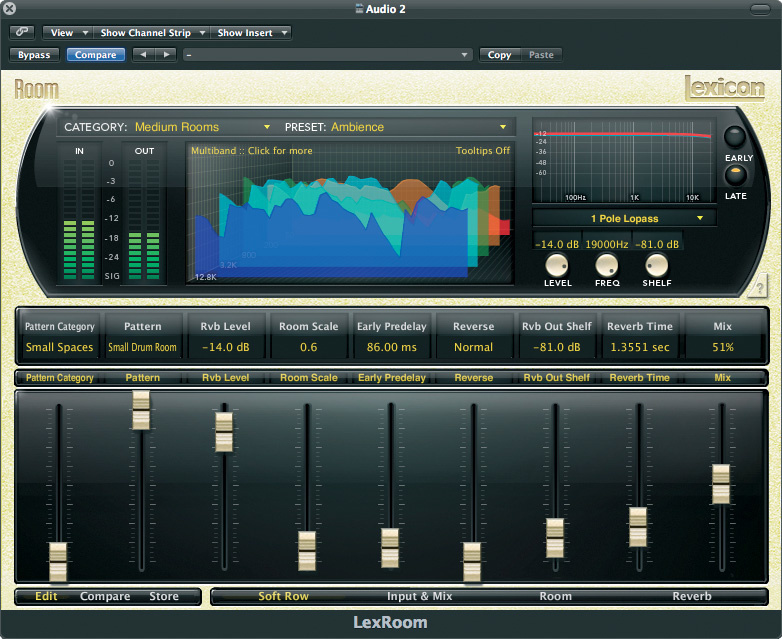 Like the original PCM96, the Lexicon native plug‑ins are strictly stereo. You could use two or more plug‑ins with different settings to fudge a surround effect, but there's no dedicated surround mode. Even so, I was surprised that the plug‑in didn't hog ridiculous amounts of processing power, given the algorithms being run here. You can see a bit of a CPU load increase once you insert Native Reverb, but nothing you wouldn't expect from any other high‑end plug‑in: most presets consumed about one eighth of one core on my Mac Pro. The plug‑in window is also sensibly large, so you can see everything clearly, though I'm not convinced the Edit button is necessary: all it does is show or hide the buttons that call up the additional parameter pages, and there's plenty of space to leave these visible permanently. Similarly, I'm not sure why the reverb types come as separate plug‑ins, as this discourages switching quickly from, say, a plate to a hall to see what the difference is. The reverb certainly sounds like the real deal. I'd say it's every bit as good as you'd expect from a PCM‑series hardware box, with no skimping on reverb density to save on processing power. If you haven't used a Lexicon PCM‑series reverb before, their strength is that they create a convincing sense of space and depth but without muddying the sound being processed, even when you add more than some might consider tasteful. There's also a noticeable absence of that 'ripping cloth' early reflections sound you get from so many less sophisticated digital reverb units where the early reflections are created using a simple multi‑tapped delay line or FIR (Finite Impulse Response) filter. Instead, the early part of the reverb is more convincing at conveying the colour and character of a real space. The reverb also blends perfectly with the dry sound, whereas less sophisticated reverbs can sound like a layer of sound pasted over the top. Part of Lexicon's character comes from the shape of the reverb tail, which isn't generally a simple exponential curve. In complex larger buildings, the reverb tail can have two or more decay slopes and Lexicon take that into account in their emulations. What's more, there are two types of delay voice: Reflections, which are simple delays, and Echoes, both of which can be modified for delay time, level and polarity. Echo also has a feedback control for creating repeat echoes, but unlike simpler delay devices, the delays pass through the reverb's input diffusers so that they appear to be inside the emulated room rather than layered on top of it. A neat touch is the Master Time control, which scales all of the reflection voices up or down by the same percentage, to save you adjusting them individually. For vocals, I really like using the Plate algorithms with the two delayed reflections, set at between 100ms and 300ms, just creeping in to support the sound. The newer algorithms tend to sound more natural than the older classics, offering a viable alternative to convolution reverbs for recreating real‑sounding spaces but, for me, the older, slightly more shimmery reverbs still sound the best for pop music. The shimmer comes in part from the Spin and Wander modulation parameters in the reverb algorithms, which can't be duplicated by standard convolution. Random Hall, Plate and Room are all extremely flexible algorithms that strike a good balance between accuracy of emulation and subjective splendour, to produce a sound that works perfectly on an artistic level. Taken together, the algorithms cover everything from near‑natural room ambience and concert halls to textural and steamy, all with that magical Lexicon quality that lets you really lay on the reverb with a trowel if you want to, yet without suffocating the sound. If you need a realistic closet or bathroom sound for film or post‑production work, you'll find one using the Room algorithm, but you can also get some great‑sounding pop reverbs and special‑effect reverbs (including some great reverse effects) out of these algorithms, without getting lost in a mire of parameters. The initial room character comes from selecting a basic 'impulse' and then modifying it, but Lexicon are keen to point out that these are not impulses in the convolution sense, but rather room character algorithms. TC's ClassicVerb for Powercore is probably closest in terms of quality and character, but it has far fewer adjustments, while the UAD platform Plate 140 and EMT 250 are equally impressive. However, Lexicon reverbs have a character all their own, and that character has been an integral part of music recording history for more than a quarter of a century, which makes it instantly familiar‑sounding and appealing. It should be pointed out, though, that you don't get everything the PCM96 hardware offers: the hardware unit can also conjure up some very sophisticated modulation and pitch programs, which leaves me wondering whether these might appear as a separate plug‑ins at some time in the future. Of course, price is an issue, and whether you view the PCM Native as a bundle or a single plug‑in that has to be handled like seven separate ones, we are talking about quite a lot of money. For the pro needing the distinctive Lexicon sound, it's probably well worth it, especially as a modern computer can power several reverbs within a typical mix, but I still can't help wondering if it might actually have been more profitable for Lexicon to keep the price more in tune with the vast body of typical project‑studio owners, many who will lust after PCM Native but will never be able to justify the expense. Cost aside, however, whether you're working on film, folk music, orchestra or pop, this is the perfect plug‑in bundle, and once you use it, you'll probably never want to mix without it. Bloody marvellous! The only plug‑in synthetic reverb alternatives I've tried that come close in quality are the DSP‑assisted TC Powercore and UAD offerings. Convolution reverbs such as Altiverb and Space Designer offer exceptional quality at a lower price point, but convolution can't capture the magical modulations that contribute to the unique Lexicon sound. Of course the other possibility is to buy a PCM96 which, with its Firewire connection, can be used as a virtual plug‑in. Here are some audio examples of Lexicon's PCM Native Reverb in action on drums and spoken-word vocals. In each case, you can hear the dry sound followed by three different reverb algorithms (I've left the kick drum dry in all cases). 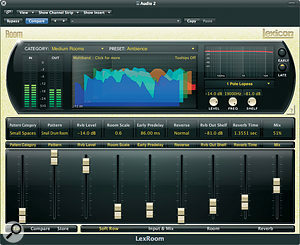 'Real deal' Lexicon PCM sound quality and versatility. 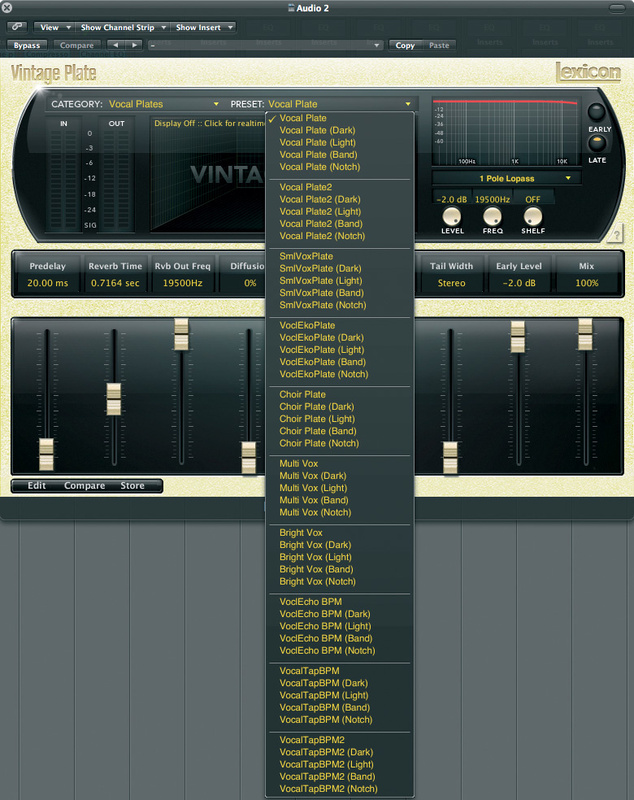 Very easy to use, with plenty of presets. Expensive for the project studio owner. This is the first native synthetic reverb plug‑in that I've really got excited about. It delivers the undiluted classic Lexicon sound but is priced accordingly. Lexicon USA +1 801 568 7567. Apple Mac Pro with 2 x 2.8GHz quad‑core Intel Xeon CPUs and 10GB RAM, running Mac OS 10.5.7.